The stories of King Arthur’s Knights of the Round Table are romances set in the mists of time somewhere between the dark ages and the middle ages. Eric – a knight of King Arthur’s Round Table – jousts to prove the beauty of a poor maiden in a simple white dress. Enide has married Eric, a knight of the Round Table. Now she begins her dream of living with her ideal knight happily ever after – but will it turn out that way in real life? Eric and Enide set out on their quest across the moors … but a quest for what? They meet bandits and rivals for the hand of Enide – and only at the end of their journey do they find out what it is they are both seeking. A medieval story for Christmas about a medieval knight who was so generous at Christmas that he gave away almost everything he had. A miracle of a cherries out of season restored his wealth. An audio drama. 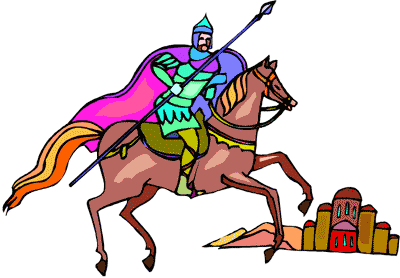 King Arthur’s noblest knight, Sir Gawain, goes on a quest which tests is honour as much as his valour. A Storynory Special, adapted for the Medieval text. Sir Gawain faces must meet his destiny at the hands of the Green Knight on New Year’s Day. In the meantime he must overcome a more delicate challenge to his honour.